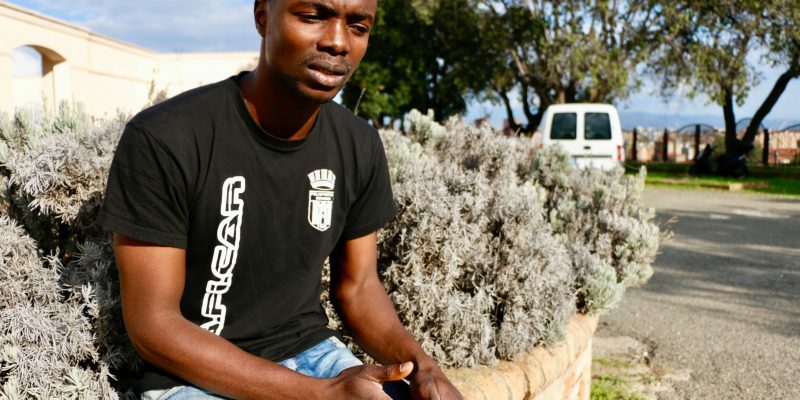 It is a warm and sunny Saturday morning, a familiar one in late-autumn Cagliari, where Peter Ositandinma has lived for three years while awaiting a decision on his asylum applications. The 26-year-old Nigerian will spend yet another weekend poring over books, as he has for a month since the University of Cagliari admitted him to its computer engineering programme. The courage to save those lives actually came at a high price for Peter: a six-month jail sentence in the Sardinian prison of Uta, from which he was released only after four appearances before a judge. The first time, he was too intimidated to speak. He had landed only a few days earlier, but had spent all his time in the hospital because of a gunshot wound to his leg that he had stitched himself in Zawara, Libya, before embarking on his journey. He had used a safety pin as a needle, with a cotton thread from the seam of his t-shirt. He’d been shot at by smugglers, and he didn’t know how else to seal the wound with the bullet still lodged in his flesh. “My leg hurt like hell once we were left alone at sea, after the passeur got on another boat,” he recalls. “The engine broke down soon after and we were desperate, because none of us knew the first thing about sailing and you better believe none of us knew how to swim.” There were a few pregnant women, too. The same women, now mothers, would appear before the judge to testify that Peter was not a smuggler, but indeed the hero who had rescued them from certain death. “It took me five hours to figure out how to get that engine started – five hours! And the pain was killing me. The others kept telling me to give up, but what other options did we have? I studied electronic engineering in Nigeria, and I tried to apply that knowledge.” At last he was able to get the engine going and the rubber boat sailed again towards the sun, which Peter reckoned was the right direction to reach Europe. 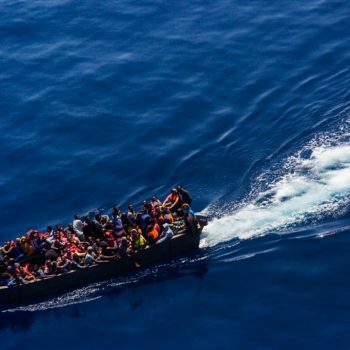 With the rubber boat now almost deflated, only the third vessel they met responded to their cries for help. Once they were rescued, Peter and the other passengers were taken to the port of Cagliari. “I spent three days in a hospital, and then they took me back to the migrant centre.” In the CAS (Extraordinary Reception Centre) of Villacidro, a small town in the province of Medio Campidano, police officers were waiting for him. Even in jail, Peter continued to receive medical treatment. Three years on, his scars are still clearly visible. 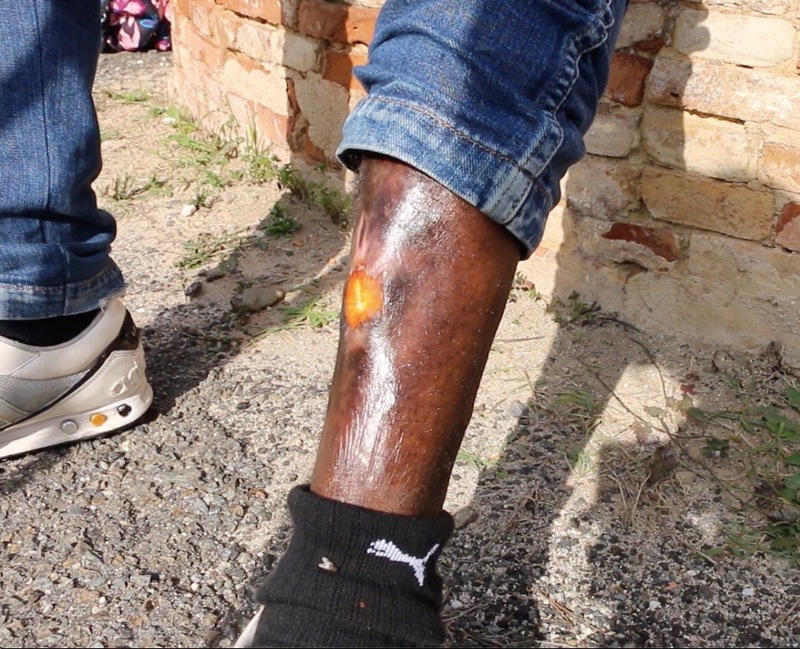 His leg had already been injured before his journey to Libya via Niger. He was working in Maiduguri, the capital of troubled Borno state, when he was caught in an attack by the Islamic terrorist group Boko Haram. At that time the terrorists were kidnapping girls and young women, who did not raise any suspicions and were therefore easier to send out to blow up markets with explosives strapped under their clothes. Peter’s uncle took him to the hospital in Potiskum, in neighbouring Yobe state, but even there a kamikaze attack forced them to flee. As the son of a Christian Igbo man from the east who had died when Peter was only 1 year old, he was terrified. The scars on Peter’s body: he was injured during an attack by Boko Haram, then shot in the same leg by Libyan traffickers. Nigeria is not a country at war, making it difficult and not at all frequent for refugees like Peter to be eligible for humanitarian protection in Europe. Yet his tale, as well as those of many fellow Nigerians, is rife with violence, death, and terror. Peter does not even remember his father’s face; he was a former member of the military who had fought in the civil war and then settled in the north, starting a business as a baker and marrying a Muslim woman from Cameroon. The conflict had left the region devastated, and reconstruction efforts afforded more job opportunities than elsewhere. The family of Peter’s mother, however, did not take well to their daughter’s marriage to a Christian man. As soon as he graduated, Peter decided to enrol in the University of Enugu, in the south, where the Igbo were a majority. His father was from that region, the former Biafra, where secession had culminated in a bloody civil war which had lasted until 1970. Peter’s main sources of income, however, were in the north. So he would alternate between Maiduguri and Potiskum, studying and working. It was during one of those working spells that he was injured in one of several terrorist attacks. Twenty years spent fleeing sectarian violence in his home country, followed by imprisonment and torture in Libya, meant that Peter had no idea what it meant to live safely and peacefully until he arrived in Italy. While in jail, Peter asked for books to study Italian. After a few months, he was already able to communicate with the other inmates. He still finds it hard to believe that the prison had a library, TV sets, and a soccer pitch. Prison as he knew it was a very different reality. In Libya he had settled in Ghadames, where he was able to find employment as an electrician, until armed conflicts forced him to seek refuge in Tripoli. There he was robbed and imprisoned, and his friends were murdered in front of his eyes. “For those people, it’s business,” he says. “They take us black people, lock us up, and force us to call our family for ransom. If no one pays, you get killed.” Sometimes, once the ransom was paid, the jailers would come and call out the prisoner’s name. If no one replied, someone else would come forward. Other times, when prisoners were doing forced labour, someone would manage to escape. As did Peter, who fled to Zawara with a group of fellow Nigerians. Peter spent two years in Libya, the worst years of his life. Peter remembers how his attorney covered his eyes every time he and another migrant detained in Uta (whose buttocks were all but flayed) showed him their wounds. Peter was one of 12 asylum seekers to obtain the European Qualifications Passport for Refugees in July of last year, the first of their kind in Italy. For now, he is hoping for a positive decision on his asylum application, and occasionally works as a cultural mediator in a court.